What's new in Linux Mint 6 Felicia? 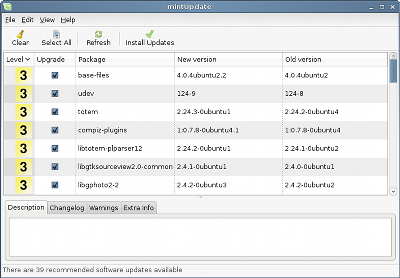 Based on Ubuntu 8.10 Intrepid Ibex, Linux 2.6.27, Gnome 2.24 and Xorg 7.4, Linux Mint 6 "Felicia" comes with a brand new "Software Manager", FTP support in mintUpload, proxy support and history of updates in mintUpdate, mint4win (a Linux Mint installer for Microsoft Windows), tabbed browsing in Nautilus and a lot of other improvements. 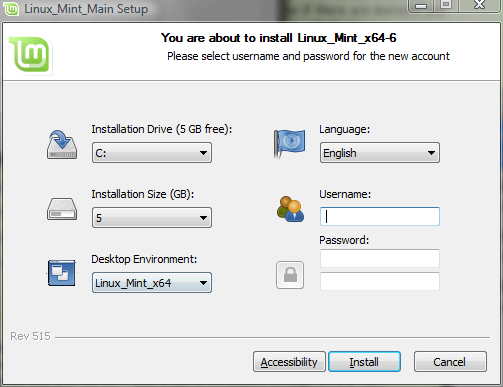 mintInstall 5, the "Software Manager"
The content of the Linux Mint Software Portal can now be browsed offline and directly from the desktop thanks to a brand new frontend developed for mintInstall. The frontend can be used to quickly browse through available software, view screenshots and user reviews, sort by various criterias of popularity, check installed and available versions and eventually install software. The frontend uses XML meta-data to synchronize its content with the online portal and also has the ability to support additional 3rd party portals if other portals decide to support our XML format in the future. 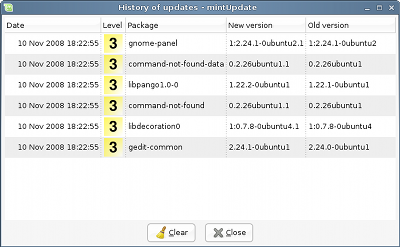 The Linux Mint Update Manager "mintUpdate" was refactored and its graphical interface was redesigned from scratch. A new view was added to browse through the history of applied updates. 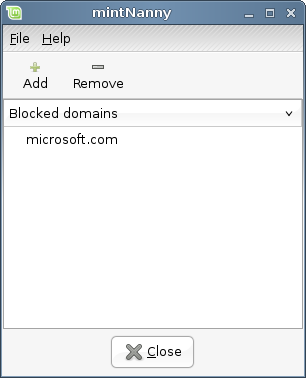 Proxy support was added in the preferences. The routine which checks for the updates (called checkAPT) was improved and so was the way it communicates with mintUpdate. MintUpload is the little tool which pops up when you right-click on a file and select “upload”. Until now mintUpload was mostly used as a way to share files by uploading them to a public place somewhere on one of Linux Mint’s servers and by sending the corresponding URL to friends and family members (or to anybody really..). Some people also bought Mint-Space accounts and were able to set up mintUpload to add an additional upload service to it. These people could then share files in a similar manner but instead of using a public storage space and being limited to 2 days, they could use their 1GB of Web space and have their files kept there indefinitely. Initially mintUpload was designed with novice users in mind, people who wanted to share large files with each others and who didn’t know what FTP meant or where to get free web space to store them. After gathering some feedback, we’ve come to realize that mintUpload also got popular with experienced users, people who even had their own FTP accounts and wanted a quick way to upload files to it without launching an FTP client. So we added FTP support to MintUpload by defining another type of service and letting the user define his own FTP services. The “path” is optional, it lets you define where within your FTP service you want the files to be uploaded. In this example we’re not uploading them in the root folder, but within a directory called “myuploads”. A new command called "search" was introduced to let you search for files containing a particular keyword. The command searches recursively, it highlights the results in red with their corresponding filenames and line numbers and it can even search through binary files. The content of a package can now be shown by typing "apt content packagename" and you can list the package providing a particular file by typing "apt contains filename". If you run Microsoft Windows, insert the liveCD and a program called mint4win will launch automatically. This program is an installer for Linux Mint which runs on Windows. It installs Linux Mint within a file on one your partitions and it doesn't touch your existing partitions. It also sets up a Windows multiboot for you. Of course the performance won't be as good as if the system was installed in its own partition but if you just want to give Linux Mint a try this is a very good option. You can remove mint4win from the Add/Remove applications tool within Windows and this will remove Linux Mint and restore your boot exactly as it was. Note: Mint4win is based on Wubi. Flegita, a Gnome utility for scanner devices, was also installed by default. 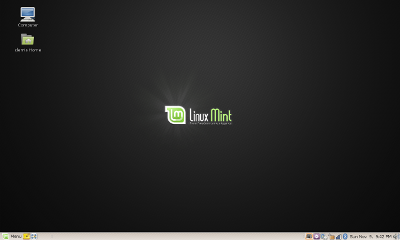 Linux Mint 6 Felicia comes with linux 2.6.27-7, and Xorg 7.4. Read this article for an overview of the new kernel. Dell's DKMS was included by Ubuntu and allows modules to be automatically rebuilt when the kernel gets upgraded. For more information about DKMS read this article. Gnome 2.24 comes with tabbed file browsing and better support for multiple monitors. Ubuntu 8.10 also enhanced multiple aspects of the desktop and the result shows many improvements. Gimp 2.6 features a much nicer interface. Network Manager 0.7 provides system-wide settings (no need to log in to get a connection), management of 3G connections (GSM/CDMA), management of multiple active devices at once, management of PPP and PPPOE connections, management of devices with static IP configurations and route management for devices. The new version of the Ubiquity installer features a graphical representation of your partitions and a new auto-login option for GDM. Totem comes with BBC and Youtube plugins. The ClamAV antivirus is now officially supported by Ubuntu and should be kept up to date within the repositories. It is now possible to start a guest session from the user-switch applet. "Open as root" now uses Nautilus in root mode with a red background. 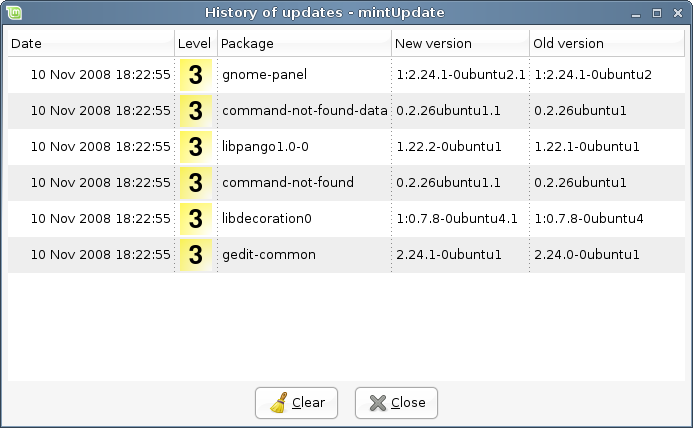 It is now possible to configure the menu icon and the search command in MintMenu 4.1. Linux Mint now uses its own LSB information and no longer identifies itself to applications as Ubuntu. This can potentially break compatibility with some 3rd party tools. If you experience problems with this, let us know and we will contact the appropriate developers. 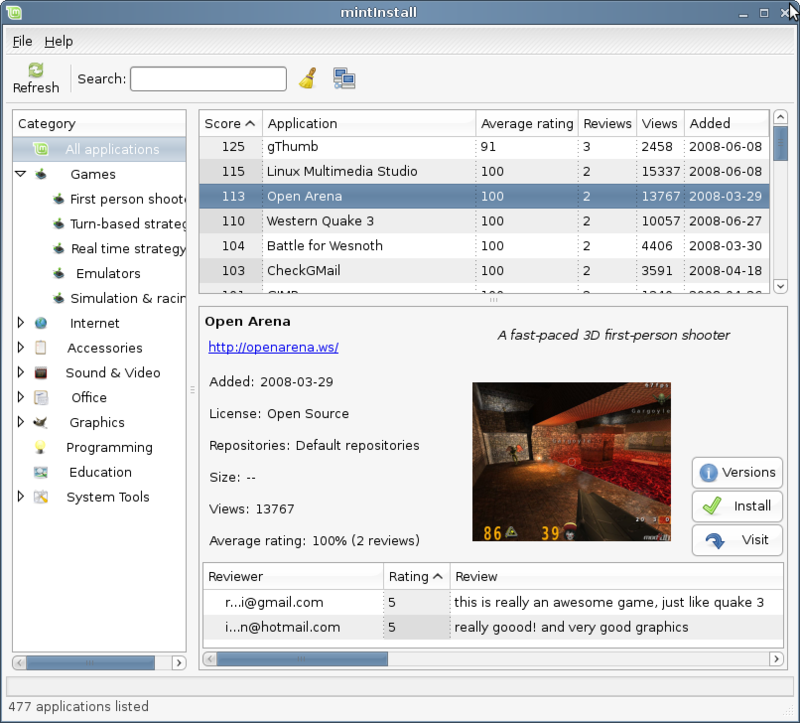 Meta-packages were introduced within the repositories to reflect the default selection of packages for the various Linux Mint editions. The artwork now also comes as a package. The Linux Mint project as a whole is going through important changes. The new focus is given to R&D and the design of desktop utilities more than to the base system itself. The project aims at automating the porting of its technology on top of the current base in an effort to rebase on every single Ubuntu release instead of following its own branch since the initial fork of Edgy. Since the Edgy/Barbara fork, Linux Mint 6 Felicia is the first release of Linux Mint Main Edition to be built directly from Ubuntu and not from the preceeding Linux Mint release. The advantages of this are to guarantee an even higher compatibility with Ubuntu, to speed up the process of jumping from one release to another, to automate the process of porting our technology (which can then be used to "mintify" Ubuntu or other distributions) and above all to guarantee that most of our time goes into desktop innovations and not in the actual releases themselves. 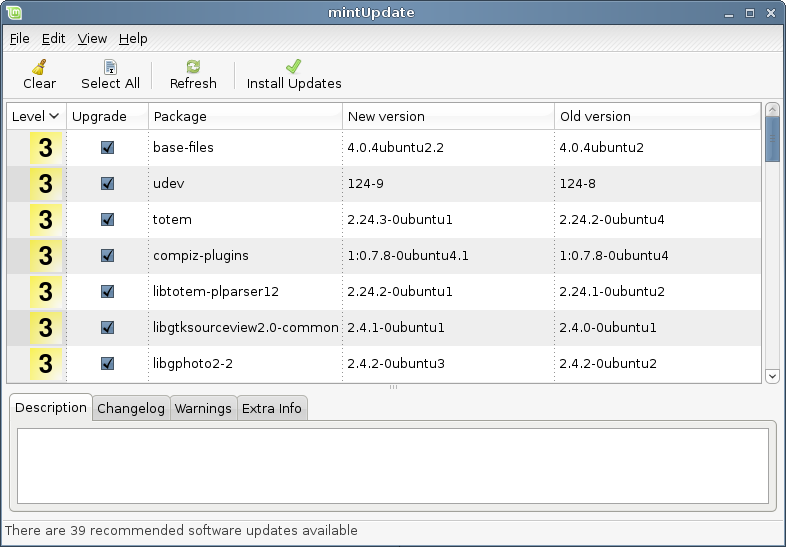 An upgrade tool was made available to automate the process of upgrading from Linux Mint 5 to Linux Mint 6. The Light Edition is now called the "Universal" Edition and it consists in a live DVD with support for all major languages and a menu item to automate the installation of all missing codecs. 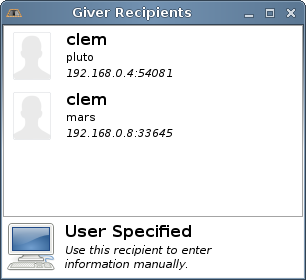 A technology called "xdg-user-dirs" is now used for the home folders instead of mintDesktop. This means home folders no longer come with emblems but they are localized and bookmarked.